XML in book publishing has been a controversial topic in recent years. Some have even questioned if XML has failed publishing or if publishing has failed XML Challenges are often further compounded in situations where book publishing services (eBook and XML) are outsourced offshore where communication and cultural differences often exacerbate issues with technical services. "We've been getting XML from our vendors for the past ten years. I have a drawer full of CDs—every book we've published. We've just discovered that we have a mess on our hands because the XML is totally inconsistent. We're going to have to start over." Many factors contribute to challenges with XML when outsourcing. It is interesting that XML related work with books—the core intellectual property of publishers—is often outsourced offshore and is often processed in mechanical, factory-like environments. Typically, the content is processed by software automation tools by un-skilled workers who often struggle to read or speak English. The objective is to somehow complete the job with complete accuracy from front to back. Many publishers and authors might be angry or shocked if they actually saw how their books were handled by offshore service providers. Another issue that has become a challenge with outsourcing is employee turnover. The fact that many offshore providers experience significant employee turnover is rarely discussed. Many authors and publishers are unaware of the impact this has on quality. Employee retention with offshore service providers can often be as short as a few months and it is not unusual for turnover to be as high as 30% per year. This means that every three years, the entire staff has often changed. Publishers' timelines and quality are often jeopardized when an experienced offshore copyeditor or production editor leaves the service provider and is then replaced by a less experienced employee. Some of the quality issues come from the fact that books have a wide spectrum of variability. Each author writes and formats differently. Templates can help, but often times, adequate software tools are not available to accommodate such variability in design and layout. Also, there are often disconnects between the infrastructure and toolsets used by service providers, publishers, and authors. 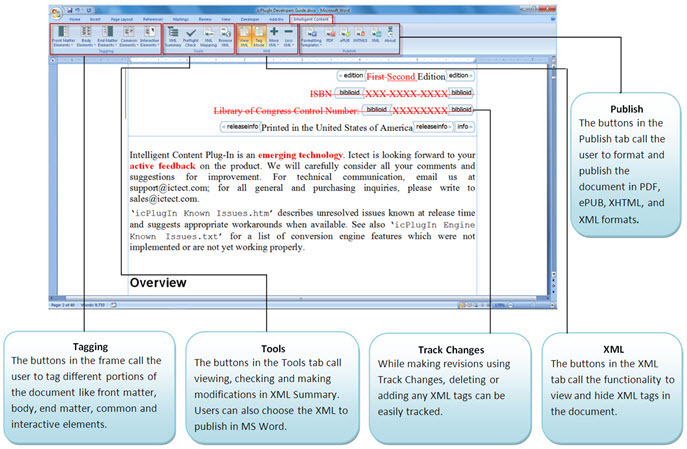 Service providers often use technical tools such as XML editors or Adobe InDesign, whereas authors and others in the publishing process use Microsoft Word. The disconnection between authors, editors, and offshore service providers often leads to difficulties in proofing and communication. Frequently, authors print PDF documents and then provide comments manually with hand-written notes. What many think of as a highly automated process, is often sprinkled with many manual steps. So much for automation in digital publishing workflows! This comment highlights the often confusing and contradictory notion of the effectiveness of a true XML first workflow that many technical pundits say is very important, but in reality, very few publishers follow. At Ictect, we have focused on Microsoft Word and tools based on Word—including our patented XML technology—to provide high quality XML. The publishing process is streamlined because everyone—authors, reviewers, copyeditors, production editors, and others—use Microsoft Word. By implementing tracked changes in Word, there is no need to manually print and scan documents, and XML is a natural by-product of using our toolset from the very beginning. End-to-end (manuscript to production) from Microsoft Word which is applicable to simpler books that do not have more complicated designs such as fiction. Workflow with XML editors such as InDesign which is ideal for books with more complex designs such as academic text books. Most publishers do not believe that Microsoft Word can be used for composition. However, at Ictect, we see publishers pleasantly surprised when discovering that formatting from Microsoft Word is automated, and reliance on manual processes is no longer needed, especially in the proofreading stages. Many of the formatting problems in Word are due to the manual tweaks and formatting mistakes introduced during the creation of the document. With good quality XML that comes from our product, the need for manual tweaking is minimized which improves XML quality, publication scheduling, and overall workflow processes. Publishers' perception of "good quality XML" from Microsoft Word is also often skewed. Many have only seen the "ugly looking" HTML-like output from Word. It is believed that good quality XML cannot come from Word. With Ictect, this is simply not true. With our plug-in for Microsoft Word, publishers can get very high quality XML output at any stage in the workflow. We guarantee it! The screenshot below shows it. Ictect is also moving in the strategic direction where obtaining an XML-tagged document straight from the author is possible. In short, the author can deliver high quality XML to a publisher without knowing anything about XML. This has been a topic of discussion with many well-known publishing consultants such as Mike Shatzkin and others in recent publishing conferences and workshops. The idea of an XML workflow that starts before there is an author is what Ictect calls Content Architecture. Ictect has focused on Intelligent Content Architectures from its inception. Virtually all publishing organizations we have worked with started with a small scale proof-of-concept. Ictect welcomes the opportunity to discuss your unique publishing workflow needs. Most proof-of-concepts create value very quickly, even in the initial stages. Most publishers have discovered an increased number of options via XML. Since receiving clean, verified XML is no longer a problem, expanding, creating, or developing more granular XML is possible. This allows for a much broader range of possibilities for the distribution, dissemination, and resale of content in any format. The Ictect technology now gives publishers a way to control XML in house and reduces or eliminates the burden of trying to create quality XML. If you are interested in a streamlined way to implement an XML first workflow, we can give you the tools to make it a reality. Do you want to discuss proof-of-concept for your books and with your editors?